Twistfix launch an innovative range of insulation fasteners, featuring a unique corkscrew design to provide easier and more secure fixing of insulation. 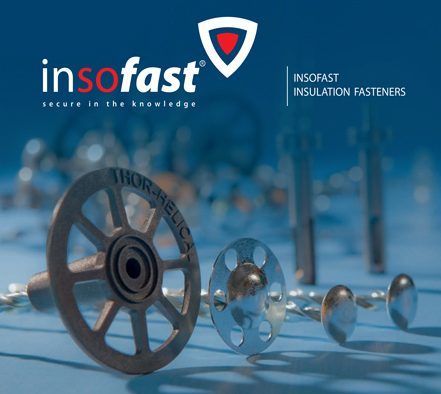 INSOFAST fixings are approved by leading insulation manufacturers and suppliers for a wide range of applications . These versatile insulation fasteners are suitable for a wide variety of substrates when driven home using a conventional hammer or a special SDS hammer drill adapter. Hammer in directly or use pilot hole when fixing into harder substrates such as brick and concrete. They can also be fixed directly into aircrete blocks without pre-drilling and into timber. The patented fasteners have a thermally-efficient spiral shaft, 75% smaller in cross sectional area than conventional shafts of equivalent diameter, providing reduced cold bridging and minimised disturbance to the materials being used.